Reply "For Mr Watt. Burntisland". Cullen believes that the fever he recently suffered has slowed his progress, 'but I hope you will soon get over it'. Summary Reply "For Mr Watt. Burntisland". Cullen believes that the fever he recently suffered has slowed his progress, 'but I hope you will soon get over it'. 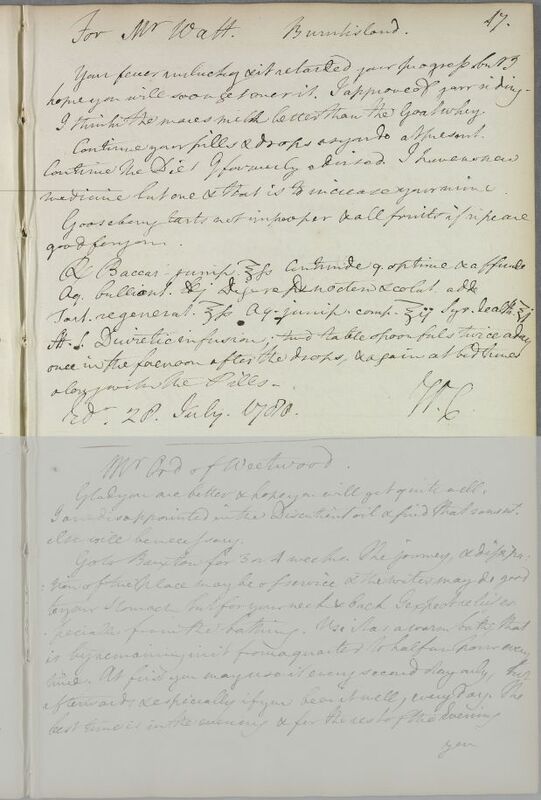 Case of Henry Watt who initially reports a bad cough and 'tumours' on his ribs; he is subsequently treated for swollen joints and severe rheumatic pains. hope you will soon get over it. I approve of your riding. I think the mares milk better than the Goat whey. Continue your pills & drops as you do at present. medicine but one & that is the increase your urine. Aq. bullient lbi Digere per noctem & colat. adde.